Tatyana Chernova’s 2011 world heptathlon gold medal has been annulled due to doping violations, with Jessica Ennis-Hill in line to benefit. 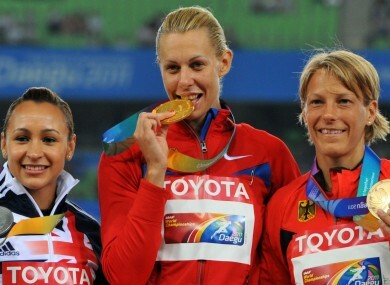 Jessica Ennis-Hill, Tatyana Chernova and Jennifer Oeser in 2011. JESSICA ENNIS-HILL will have a third world heptathlon title to add to her 2012 Olympic gold after Tatyana Chernova saw her 2011 victory revoked due to doping offences. At the World Championships in Daegu five years ago, the Russian finished 129 points clear of defending champion Ennis-Hill to top the podium, with Germany’s Jennifer Oeser taking bronze. However, on Tuesday, Chernova was one of three Russian athletes found guilty of flouting anti-doping laws and she was stripped of all results between 15 August 2011 and 22 July 2013, meaning she also loses the bronze she won at the 2012 Olympics, when Ennis-Hill took gold. The news was revealed in an announcement from the Court of Arbitration for Sport, which confirmed that middle-distance runners Ekaterina Sharmina and Kristina Ugarova had also been found guilty. Chernova, 28, has been banned for a period of three years and eight months from February 2016, while Sharmina’s suspension will run for three years from December 2015 and Ugarova’s two-year ban has been back-dated to September 2015. All Russian track and field athletes were banned from the Rio Olympics this year after a report discovered widespread, state-sponsored doping in the country. Email “Weeks after retiring, Jessica Ennis-Hill to receive third world title”. Feedback on “Weeks after retiring, Jessica Ennis-Hill to receive third world title”.